The road cycling race season is just about to begin and in some countries they have already started. Today I will show you some highly effective techniques that will help you to perform better from the very first race. One of the most common arguments against interval training during the winter is the risk of peaking too early. If you are not competing at a professional level, your risk of peaking too early is extremely low. Remember that your current fitness leaves significant room for improvement and that’s why it makes sense to train longer, faster and more frequently. You are far from peaking. So including intervals as part of your winter training makes perfect sense. It’s a cornerstone in many successful training programs. Finishing a solid base training leaves you with a strong aerobic engine. Your threshold power is now close to maximum and you are getting lean and ready to enter the cycling races. Still, you might have the feeling that your legs are not ready for the big races. Have you ever completed a solid base training left with the feeling that you still lack race speed to perform optimally? Have you (or some of your cycling buddies) ever used ‘lack of race speed’ as an excuse for not performing as well as you were hoping for? The case is that a solid aerobic engine alone is not enough to win cycling races. Even though threshold power is often referred as the single most important physiological parameter, having a decent power output at threshold power is not enough. Most often you will need both anaerobic endurance/sprint skills and also a highly trained VO2 max to be competitive in cycling races. Why? Because in most cycling races winds play an important role. When you ride behind other riders in the bunch you may save up to 40% of power output to maintain the pace. Thus, if you just sit in the front of the peloton and work around your threshold power, all other riders can easily follow your pace as long as you ride in the flat or slightly uphills. So if you want to make a breakaway or drop some of your worst opponents then a steady pace at threshold power might not be enough. Instead, you need to use your anaerobic and tactical skills to establish a breakaway. And then afterwards return to a steady pace slightly below threshold power in your new group of riders. To be able to make these breakaways you’ll need to have at least some anaerobic power to accelerate away from the peloton. It’s clear that the more aware your opponents are, the harder you will have to work to get away. Also, as you get closer to the finish line you should expect more riders to react when you make your attempts. You could see their awareness as a problem or you can see it as your opportunity to strategical alternatives. By leveraging from other riders impatience, you can actually make tactical moves that are far more likely to succeed than with most solo attacks. Also if you stay away from the front and simply let the attacking rider protect you from the wind, you can relatively easy join the attack. That way you have a chance to join a new breakaway while saving your anaerobic power for later. Even experienced and ambitious riders get surprised when they enter the first couple of races in the season. Some of them may have increased their total training load significantly during the winter and therefore – reasonable – expect to perform better. However, many of these talented riders don’t get the results and honour they have worked so hard for. Because they struggle so hard to increase the total training time and intervals, they forget to remind themselves of the importance of having a good overall structure on their training plans. If there is no structure on your intervals, distance training and cycling races then all else is meaningless. Forget about exotic recovery drinks, aero wheels, carbon saddles etc. If there is no structure on when you train hard and when you don’t then this is the first place to improve your performance in the long run. Simply put: structure is the best and most effective way to increase your performance. And you don’t have train harder. Why are the first cycling races in the season so difficult? One of the most common excuses is ‘lack of race speed’. I agree with this cause, but I don’t think it’s very precise. Switching from group rides at 30km/hr to cycling races at 40+ km/hr is not only a question of speed. It’s a paradigm shift from riding friendly group rides to entering a war on bikes. Let me explain: If you haven’t included high intensity intervals and riding in your training yet, you will very likely experience ‘lack of race speed’. And you will experience it the hard way. To make it clear: If you are not prepared, you will be punished. Those riders who dominate and win these first races are typically well prepared. They have followed their training programs for months and they have been doing some kind of high intensity (anaerobic) training in the past. And that gives them what is commonly referred as ‘race speed’. So yes, in races you ride 10km/hr faster, but that is only a part of the explanation. The physiological and technical demands are quite different when you enter a cycling race. So if you want to be one of those riders who are well prepared when the race season opens, then you have to use some of the pre-season training techniques mentioned below. Otherwise, you will be one of those riders whining about ‘lack of race speed’. Though, the good news for lazy riders: If you haven’t done your anaerobic training, you will catch up within 6 to 8 weeks. That’s what many cyclists experience season after season when they have entered the first ten races or so. Simply, because their anaerobic capacity gets a boost from participating in the cycling races. That also means, that if you plan to peak later in the season, you don’t have to push too hard with anaerobic intervals and sprints before the season opens. But it will make your life in the peloton a bit easier and maybe your winning chances are also better in early part of the season. Making your training more similar to races is a logic step that helps you prepare for the cycling races waiting for you. Instead of riding steady pace group rides, you should include two or three short races with a predefined distance of 5km or up. These friendly races give you a nice combination of aerobic and anaerobic intervals while riding your bike at higher speeds. You will also get a sense of race tactics if you include a finish line for your friendly race. Though, this training approach is an unorganized way to train compared to most of the other advice I give, it’s a very effective and inspiring way to optimize your aerobic and anaerobic systems. Well performed, these Fartlek sessions are both highly effective and motivating as pre-season workouts. 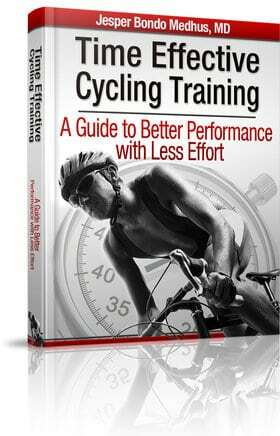 Remember that most cycling races are not organized in 15-minute sub-threshold intervals. Cycling races are extremely unpredictable and you will need a wide repertoire of skills to master them. So spontaneous cycling races or sprints are an excellent supplement to your regular, scheduled intervals. The secure way to boost your anaerobic performance is through specific intervals designed for anaerobic performance. These intervals are typically shorter efforts of less than 60 seconds. The intensity is so high and the duration so short that using a heart rate monitor for pacing makes no sense. Even without any pacing tool, it is relatively easy to get a great boost of your anaerobic power and endurance. Simply by doing anaerobic intervals once or twice per week, your anaerobic capacity will increase significantly within a few weeks. It is much faster than building aerobic power, so even if you are a bit late, you have a good chance to catch up quickly. One important thing that most riders are not aware of is the need for recovery between hard anaerobic intervals. Why? If your recovery periods are too short, you will not be able to generate sufficient high power outputs in the work periods and more work will be performed through aerobic metabolism. Thus, you will not get a sufficient stimulus for your anaerobic enzymes. The most overlooked secret of winning riders is their use of tapering. If you want to make a really great ride, you should make at least some kind of tapering protocol before the races you prioritize. That will make your legs and mind fresh, and help you to perform much better than most of your opponents. Especially in the early part of the season many riders have been through a heavy amount of training. With reference to the overload principle, these riders need a few weeks of tapering before they are able to perform at peak performance. 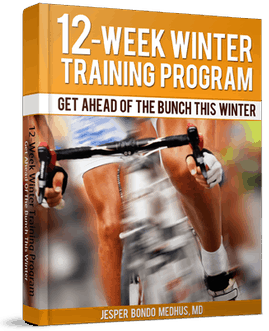 Winter training is often considered as the most important part of your preparation for next season. Why not also use your best weapon to improve aerobic performance? As I mentioned previously in this article, you might choose to prioritize differently. If you spend less energy on optimizing your anaerobic system now, you will be able to build an even stronger aerobic engine. And because of that you can be even stronger later in the season. That is always a question of priority. Even though my 12-week winter training program forces you to tackle scheduled intervals three times per week and also perform an increasing amount of training, there may still be opportunities to ride more. Don’t be afraid to add an extra interval or a spontaneous friendly cycling race. Yet, it’s my gut feeling that many riders don’t prepare optimally for the season opening. And just a little tweak to your current training can make a nice improvement in your opening races. Thus, I conclude that intelligent riders get an easy advantage in the first few weeks simply by optimizing their training. VO2 Max intensity refer to your avg. power output (Watts) in 5min test. Thanks for this timely post Jesper! Today I did your Pre-season Training Programme 3 and next week will have a go at the ultimate VO2 Max Training Session. After a winter packed with threshold training I hope this will be the icing on my fittness cake! Hello I ride road “Weekend” experienced, 44 with many years of riding in the saddle, riding regularly four times a week. 1 +2 +3 +4 Spinning weekly hours. Throughout the years competed dispersed and seldom, does not like the stress involved in the competition. Also I had no free time to train properly. The day after my release from the army, I’m free and want to challenge a term of six months from now to participate in competitions. Jesper-concerning the pre-season session# 2. It says, 3 x (40s + 9.20min) maximum sprint efforts. Is there a typo or am I missing something on the “9.20min” portion. What exactly does that mean? Thanks! 9:20min recovery between the short 40 sec efforts is correct. This relatively long break is necessary so that you are able to generate maximum power during the 40sec sprints. If you’d start the next sprint too soon your legs would still be tired and could only perform at sub max power. Hope that makes sense. A bad day on the bike is better than a good day in the office. What Do You think about starting 14-days VO2Max training just after a few Months winter pre-season preparation as a booster before a first start in season? For example: 3-4 Months winter training then 14-days VO2max training, 2-4 days rest and a first start. Does it make sense?